Less well-known than the Avro Lancaster, the Halifax was the other mainstay of Bomber Command operations between 1943 and 1945. Originally designed as a twin-engine bomber, the prototype Halifax eventually flew for the first time in October 1939 with four engines. The first production model was delivered in October 1940 and eventually two distinct streams of Halifax were produced: those powered by Rolls Royce Merlin engines (Marks I, II, and V) and those powered by Bristol Hercules engines (Marks III and VI - IX). The Halifax was widely known as the "Halibag" by its crews. Early Merlin-engine Halifaxes had a relatively low operating ceiling that meant they suffered heavily from ground fire. In 1943 this led to the Halifax being restricted to attacking less well defended targets. Attempts to improve the Halifax by streamlining the fuselage, engines, and other components were not entirely satisfactory, so it was decided to install more powerful Bristol Hercules engines. The first operational flight of a Bristol Hercules-engine Halifax occurred in October 1943 with 466 Squadron RAAF. Eventually, Hercules-engine variants accounted for over half of the 6,177 Halifaxes produced during the war. The Halifax was the only British heavy bomber that permanently operated from the Middle East, and it was also widely converted to act as a transport, glider tug, paratroop carrier, and electronic counter-measures aircraft. Production of the Halifax finally ceased in November 1946. As with the Lancaster, a 'civilianized' version of the Halifax, known as the Halton, was produced in small numbers but the idea never caught on as there were a lot of surplus transports on the market after the war that were much more easily converted into airliners. A hundred bucks for a short run kit!! You have to be bonkers! Undoubtedly this is the first thought when confronted with the latest from the French short run kit maker, Fonderie Miniatures. But let's step back and think about things for a bit. In comparison to some other 1/48 four engine bombers, it really isn't that terrible. Sure, the Monogram B-17 and B-24 reissues are only in the $30-40 price range with the B-29 a bit more than that. But these kits are thirty years old and so the molds have been amortized and they can afford to sell at a more reasonable price. The other big heavy in this scale is the Tamiya Lancaster, and though equally as old, it last sold in the $85 dollar range with any reissue sure to be higher. I just saw the motorized version at a show and it was $122 retail. Now things aren't looking quite so outrageous. I mean think of it. Someone has taken the plunge into producing one of the 'big three' in terms of British heavy bombers. F.M. has chosen the most successful of the Halifax versions, the Mk. III which helped to bear the load of Bomber Command's night time bombing effort. Molded in a semi-translucent white plastic, it is typical of what one expects from French short run kits. Is there flash? Enough to do a 1/72 Spitfire. How about sink areas and other surface irregularities? Oh yes, you have those as well, though not as bad as you might expect. Well, I'm sure there are ejector pin towers. Sure there are, all easily removed. Well how about resin bits? There is a bag of very nicely done resin. It includes the first time I've seen full twin row radials done in by F.M. In addition to that, the carb intakes, 'hedgehog' exhaust, oil coolers, tail wheel well and various interior bits are done in resin. You also get a full batch of cast metal bits. These are for the main landing gear, the tail gear, seats, control column, guns, barrels and a bunch of other bits and pieces. Though I'd have liked to have seen the gun barrels in resin (as most of the skinny metal bits will have to be straightened out), at least with them in metal they won't be easily broken. Clear bits are injected plastic for the flat windows and vacuformed plastic for those that have any curve in them like the cockpit, bombardier's nose piece and the gun turrets. Since F.M. 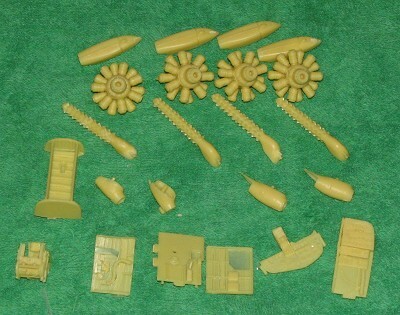 cares about its customers, there are spares of all these vacuformed pieces. The molding is fairly well done. Not Falcon standards, but not bad. Hidden in the bottom of the box and so not shown is a photo-etch fret as well. This includes seat belts (for the pilot only), some throttle bits and some rather complex looking bits for the bomb bay doors as well as some sort of radar antennas that fit to the side of the nose (like you see on photos of C-47s). 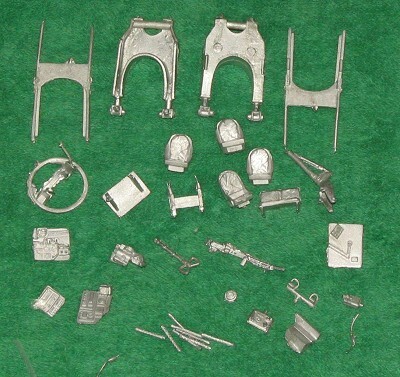 The cockpit and bombardier's section is quite well detailed with all these various bits available. You also can position the bomb bay doors open and you have some ordnance to stick in there so it won't look too empty. The flaps are also separate so that they can be placed in the lowered position. While this is a nice option, my ancient (1960) William Green 'Bombers of the Second World War' reference shows them all with the flaps up. Perhaps this was the norm, but you do have the option. I should also point out that FM has provided some rather beefy spars to hold those wings onto the fuselage. The huge main wheels are weighted and I'm thinking that perhaps the True Details Lancaster resin wheels will fit. Instructions are really rather good. The dual French/English instructions are not bad. the construction drawings are a bit crude compared to someone like Italeri, but they are well done and provide what appears to be fairly good parts placement information. Really, only building will show any areas that need improved. There is no interior or piece color information given. I can only assume that the folks at FM figured that you should have a pretty good idea of what colors to paint the inside of these things (mostly British Interior Green). There are three markings options. All are the same colors of Dark Earth/Dark Green over Black. 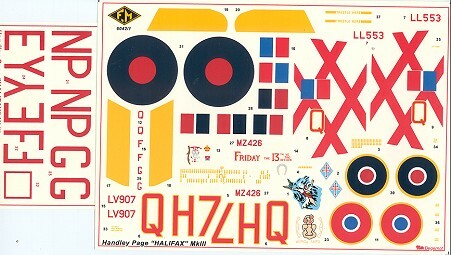 There are two decal sheets provided, one of which is quite large. You have markings options for three planes. One with a red lattice outer fin is French from 346 Sq, while of the other two British planes, one has yellow diagonal stripes is from 158 Sq and the second, with white horizontal stripes on the fin, is unknown as it appears to be a late addition. (Late note; the color of the nose art for 'Munga Taipo' is incorrect and this Maori figure should be green with red lettering. This according to reader Bill Bourke who did a presentation model of this plane using photos from the crew of the aircraft.) The decals themselves are matte and fairly well printed. I'm thinking that the red on the main sheet may be a bit too bright, but perhaps it will darken when applied. They are spot on regarding register from what I can see. I know of no aftermarket decals in this scale so these will have to do. If doing one of the British planes, it may not be a bad idea to paint on the fin markings. So there you go. A 1/48 Halifax and who would have thought we'd see one. Yeah, it is a short run kit and it will undoubtedly take quite a bit of work to complete, but you know, when one buys a kit like this, one expects certain things like that. For certain, the end result will be a beauty and will be something of which the builder can be proud. I've already started on this one so you can expect a full build review, though it won't be real soon!